Civic movements are essential to Americans' freedom and quality of life. Active citizens have led the way from the American Revolution to urban renewal. But fiery emotions and good intentions without skillful organization can lead to frustrated civic involvement. How can individual concerns be transformed into effective community action? 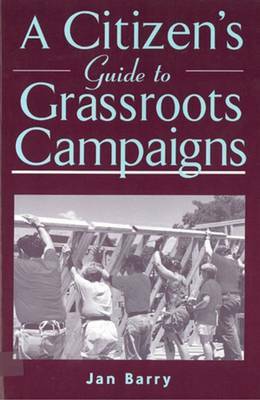 Jan Barry provides a pragmatic, common-sense handbook to civic action. Using case studies from his home state of New Jersey, Barry has crafted what he calls a "guidebook for creative improvement on the American dream." He dissects civic actions such as environmental campaigns, mutual-help groups, neighborhood improvement projects, and a grassroots peace mission to Russia. Looking for patterns to explain successes and failures, Barry includes his own experiences as a Vietnam veteran peace activist to inspire and coach fledgling activists. The result is a wealth of practical, non-partisan information on membership recruitment, organizational skills, public speaking, lobbying, publicity, conflict resolution, and more. Rising above any particular political, social, or religious beliefs, Barry shows would-be activists how to confront one enduring truth --"Democracy is a lot harder to do than it is to talk about or fight over."